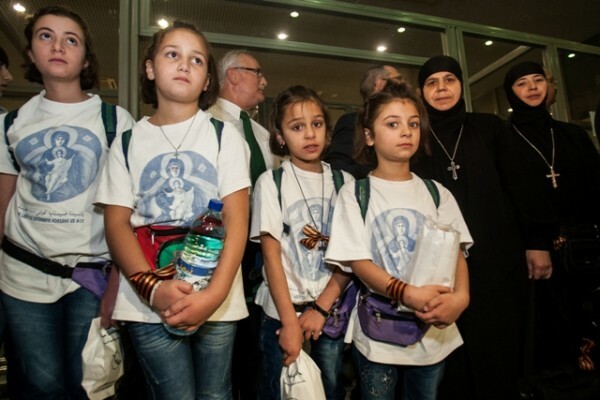 At the invitation of St. Andrew the First-Called Foundation and the Center of National Glory, orphaned children from war-stricken Syria have come to Russia for holidays. About a hundred pupils, accompanied by their teachers, from the Orthodox orphanages at the monasteries of the Orthodox Church of Antioch, located in Saidnaya, Maaloula, Damascus, and the Valley of Christians, and from boarding schools for children of deceased servicemen, will spend two weeks in a children’s health camp in the Moscow Region. With the blessing of His Beatitude Patriarch John X of Antioch and All the East, Archimandrite Yousef Yacoub, rector of the Church of the Holy Mother of God in Latakia, accompanies the children. According to the chairman of the Board of Trustees of St. Andrew the First-Called Foundation, Mr. Vladimir Yakunin, the Foundation and the Centre of National Glory are experienced in organizing summer holidays for children from trouble spots: ten years ago, 540 Serbian children from Kosovo and Metohija came to Russia for vacation. Mr. Yakunin expressed his hope that the Syrian children would remember their trip to Russia, come to love the country and would be able to forget, during their holidays, about the terrible things they had had to suffer – one of the girls who came to Moscow had lost her father only a month ago. The initiative of St. Andrew the First-Called Foundation to bring the Syrian children to Russia for holidays was discussed with the Syrian President, Bashar al-Assad, in January 2014, when a Russian parliamentary delegation, led by Mr. Sergei Gavrilov, visited Damask. The delegation was accompanied by Hegumen Arseniy (Sokolov), representative of the Patriarch of Moscow and All Russia to the Patriarch of Great Antioch, who took an active part in the organization of the Syrian children’s trip to Russia. The Syrian children will spend their holidays in the Moscow Region from July 28th till August the 11th. They will also see the Moscow sights and churches. His Holiness Patriarch Kirill of Moscow and All Russia is expected to meet with the Syrian children and bless them.